(Orion, MI – October 30, 2008) Scate Technologies, Inc. (Scate) has released Scate Ignite 4 Home, a personal version of its popular Scate Ignite 4 social media creation software with publishing options for dozens of social media sites and devices. Scate Ignite 4 Home users can now create HD web videos, HD web cam recordings, narrated photo albums and multi-media presentations for iPod, YouTube, podcasts, Facebook, MySpace, Sony PlayStation Portable (PSP), Blackberry, Treo, Windows Media Player, QuickTime and many more. Scate Ignite 4 Home can even be used to create syndicated podcasts from the kitchen table, den or home office! Scate Ignite 4 Home makes it easier than ever to transform media content, such as screenshots, home movies, PowerPoint slides, digital camera pictures, webcam recordings, text, audio and music into seamless presentations, videos and tutorials and then instantly share them around the world on just about any media sharing site or player. Scate Ignite 4 Home is being offered at an affordable price of $49.97. Scate Ignite 4 Home includes a free account at Scate’s own media sharing website (IgniteCAST.com) for podcast syndication, blog posting, message board embedding and desktop sidebars. IgniteCAST.com sharing options include iTunes, iTunes Store, iTunes U, iGoogle, WordPress, Blogger, TypePad, Orkut, Friendster, Twitter, Bebo, Tagged, Xanga, Live Spaces, Windows Vista Sidebar, Yahoo Widgets and many others. “Whether it’s vacation videos, digital photos, resumes, computer how-to’s or simple webcam recordings, people want to be able to easily create and share media over the internet and on mobile devices” said Scate CEO Steve Sadler. “Scate Ignite 4 Home offers world class media publishing capabilities to the home user at a very affordable price” he added. Scate and IgniteCAST are registered service marks of Scate® Technologies, Inc. Ignite is a registered trademark of Scate® Technologies, Inc. The Ignite Flame logo, “Ignitables”, “Capture, Enhance, Publish, Share” and “You Know – You Show” are trademarks of Scate® Technologies, Inc. All other trademarks are the property of their respective owners. ORION, Mich.–(BUSINESS WIRE)–Scate Technologies, Inc. (Scate) has officially released a FREE update for its popular Scate Ignite 4 social media creation software with publishing options for dozens of social media sites and devices. Scate Ignite 4.3 users can now transform their multi-media content for iPod, YouTube, podcasts, Facebook, MySpace, Sony PlayStation Portable (PSP), Blackberry, Treo, Windows Media Player, QuickTime and many more. Scate Ignite 4.3 makes it easier than ever for anyone to transform media content, such as screenshots, movies, PowerPoint slides, images, text and audio into seamless presentations, videos and courses. New single file output options include .FLV, .MP4, .WMV, .AVI and .3GP. Scate Ignite 4.3 continues to provide publish options for websites, email, SCORM 1.2 / 2004 learning management systems (LMS), CD-ROM and print. Scate’s own free media sharing website (IgniteCAST.com) has also been updated to support podcast syndication, blog posting, message board embedding and desktop sidebars. A small sample of the new IgniteCAST.com sharing options includes iTunes, iTunes Store, iTunes U, iGoogle, WordPress, Blogger, TypePad, Orkut, Friendster, Twitter, Bebo, Tagged, Xanga, Live Spaces, Windows Vista Sidebar, Yahoo Widgets and many others. For more information, please visit http://www.scateignite.com, or email Scate at sales@scateignite.com. Current Ignite 4.x users should click on Tools / Check for Updates in Ignite 4 to obtain the free update or email support@scateignite.com. 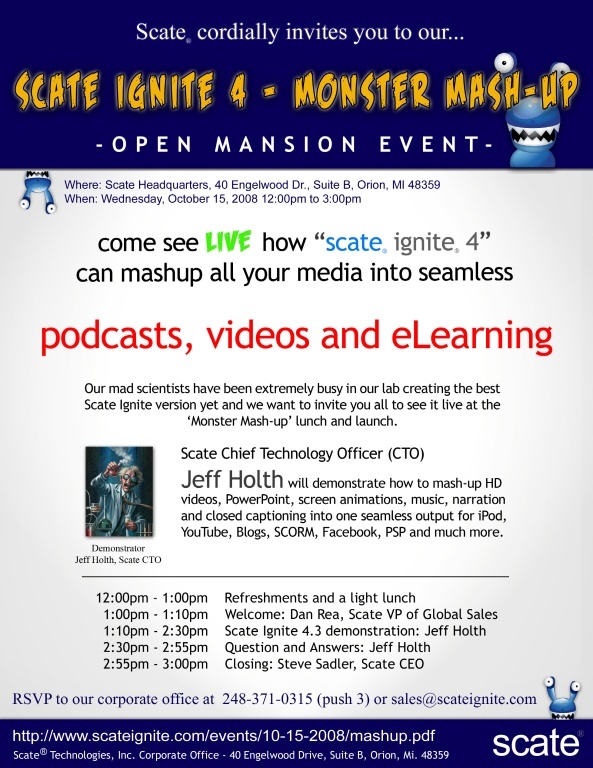 Come see LIVE how “Scate® Ignite® 4” can mashup all your media into seamless Podcasts, Videos and ELearning. Our mad scientists have been extremely busy in our lab creating the best Scate Ignite version yet and we want to invite you all to see it live at the ‘Monster Mash-up’ lunch and launch. Scate Chief Technology Officer (CTO) Jeff Holth will demonstrate how to mash-up HD videos, PowerPoint, screen animations, music, narration and closed captioning into one seamless output for iPod, YouTube, Blogs, SCORM, Facebook, PSP and much more. A printable .pdf document is available at https://www.scateignite.com/events/10-15-2008/mashup.pdf. The Waldon Middle School Festival Singers performing the song"Cing a Ring Chaw" at MSVMA District Choral Festival on March 15, 2010. The Waldon Middle School Festival Singers performing the song "Dona Nobis Pacem" at MSVMA District Choral Festival on March 15, 2010.